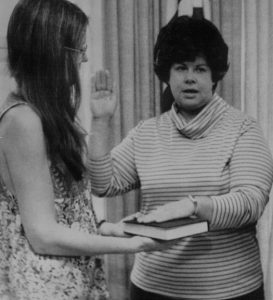 Koryne Horbal takes the oath as U.S. representative to the U.N. Commission on the Status of Women, 1977. Gloria Steinem holds the Bible. This past May, Minnesotans mourned the passing of Koryne Horbal. In her lifetime, Horbal launched the Minnesota Women’s Political Caucus and the DFL Feminist Caucus, served as a U.S. representative to the United Nations Commission on the Status of Women, and was appointed the DFL party chair at the age of 31. A vocal and unapologetic activist, Horbal was a champion for women, as well as the LGBTQ+ community. Neither the loss of her husband in 2015 nor the three strokes she subsequently suffered stopped her from working on the 2016 presidential campaign for Hillary Clinton. Horbal did not have the money to attend college in the 1950s, but Augsburg University granted her an honorary degree in 2008 due to her work as a consultant with Augsburg’s Women’s Resources Center. Koryne Horbal lives on through her children, grandchildren, and the feminist spark that she ignited in people around the world. You can read more about the extraordinary life of Koryne Horbal here.